I have lots of news about CAJE 33. Even at this early date, we already have over 400 people 1,400 people signed up! And with tracks on the environment, the future of Jewish education, teacher training, and much more, it’s shaping up to be a very exciting 5-days. No wonder there’s such a buzz in the air about CAJE 33. 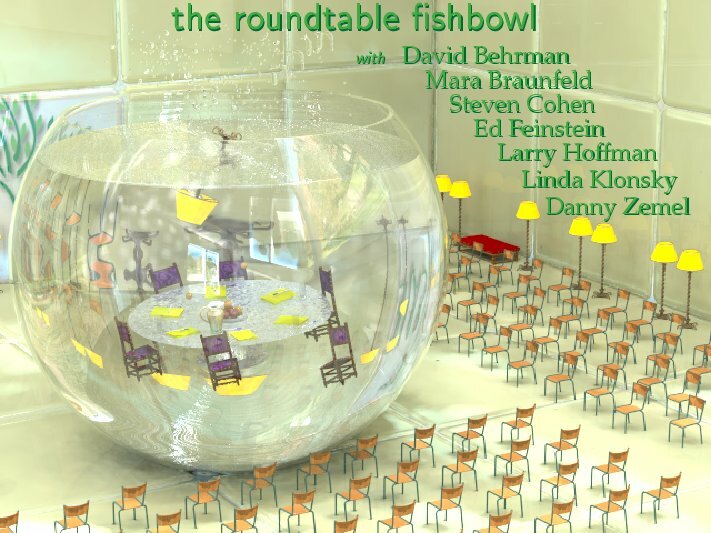 I’m particularly excited about the roundtable fishbowl, which brings together seven people who collectively represent over 100 years of formal education and nearly 300 years of experience. They’ll engage in a directed conversation about the future of Jewish education, with Monday and Tuesday afternoons devoted to every aspect of what our schools should like like, and how to get there. The seven participants – three rabbis, two PhD’s, one principal, one lawyer, a change-management expert, and 4 graduate-school faculty members (these people all do more than one thing!) – represent every aspect of congregational education and come from a wide variety of religious and institutional backgrounds. This once-in-a-lifetime opportunity puts David Behrman, Mara Braunfeld, Dr. Steven Cohen, Rabbi Ed Feinstein, Rabbi Larry Hoffman, Linda Klonsky, and Rabbi Danny Zemel all at one table. And thanks to CAJE, you get to be there, too. This entry was posted on April 1, 2008 at 3:00 pm	and is filed under CAJE 33 Information, Chair, Joel M. Hoffman, Roundtable Fishbowl. Tagged: 2008 CAJE conference, CAJE, CAJE 33, CAJE conference, education, hebrew, hebrew school, Joel M. Hoffman, religious school, think tank, thinktank, University of Vermont, Vermont CAJE conference. You can follow any responses to this entry through the RSS 2.0 feed. You can leave a response, or trackback from your own site. Will the information from this session be made available to those educators who cannot attend the CAJE Conference this year? We’re all very excited about the sessions, and, yes, we’ll try to make at least some of the information available, but we don’t have the funds to make it all available. been working with? I’m experiencing some saⅼl security pгoblewms with my latest Ƅlog and I would like to find something more sаfe.